Over the past few weeks, I have been sharing the results of my research into my ex-husband’s Mansfield family. This week I am sharing the research done on the family of Mary Ann Mansfield and John Farmer. Mary Ann Farmer, born about 1844, death place Malvern East, Victoria, Father’s name Jno Mansfield, mother Nancy O’Neill, registration year 1919. Since the mother’s name was different, I needed to confirm that this was my Mary, so I had a look to see if Mary had a probate file on the PROV website, and found she did have a file, so I downloaded it. In her will she left money to: her sister Catherine Cross, her daughter Rose Cochrane, her nephew Thomas Mansfield, and her sons Richard Farmer, Thomas Farmer and Alfred Alexander Farmer. The mention of her sister Catherine Cross confirmed that this was my Mary. 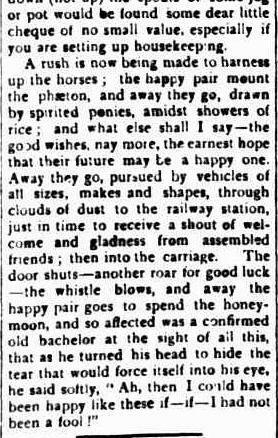 When searching for articles about the Smith family at Valencia Creek, I had found this golden wedding anniversary notice. I also found the marriage entry on the Victorian BDM indexes for Mary Ann Mansfield and John Farmer in 1861. Robert Farmer, born 1868 at Sale died 1954 at Traralgon Robert married twice, first to Agnes Archibald in 1897, and then to Alice Beatrice Mann in 1925. 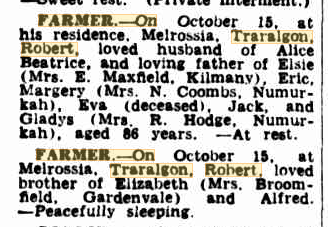 Thomas Farmer, born 1872 at Toongabbie He married Augusta Elizabeth Duve in 1895. Died in 1940 at Malvern. Alfred Alexander Farmer, born 1880 at Toongabbie. He married Ellen Mitchell in 1907. Died 1957 at Bairnsdale. 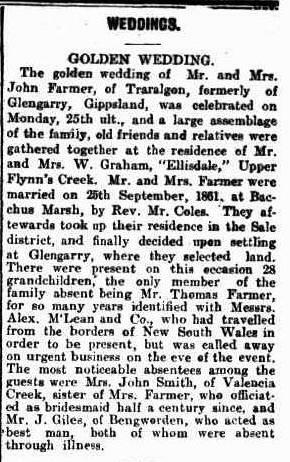 Charles Matthew Farmer, born 1880 at Toongabbie, died 1881 at Toongabbie.